Aurora Rex Ranch got a sharp lesson in the randomness of rabbit genetics last month. We bred a broken doe with a solid buck. Thirty-one days later, she kindled 9 kits -- ALL of them SOLIDS. Possible, but very surprising, since the broken gene is a dominant one. If she kindles 9 solids in the next litter, I will be genuinely shocked. 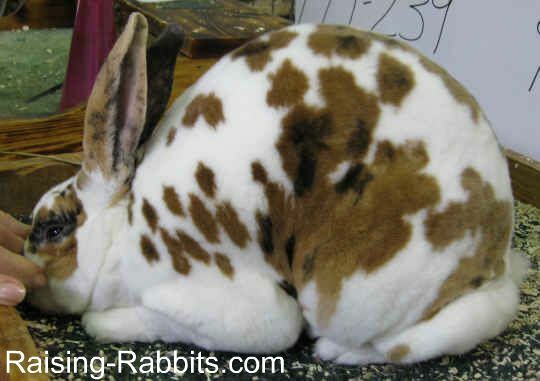 Rabbit genetics is fascinating, especially rabbit coat color genetics. Our rabbits are anxious to breed, and will be until September, which means our interest in genetic possibilities is soaring. "What colors will result if I breed this buck with that doe?" "Which doe and buck combination will best compensate for individual weaknesses and result in show-quality bunnies?" The sire’s sperm donates a single gene for a certain trait and the dam’s egg donates the other gene. In this fashion every bunny ends up with a set of two genes for every single trait he has happened to inherit. The gene pairings are totally random, which is where the fun starts. It’s like taking the genes from both the sire and the dam, putting them in a big grab bag, and shaking them up. It’s nothing more than the luck of the draw that determines what bunnies result from a certain breeding. Of course, if a gene is not present in the gene pool of the sire and dam, they cannot pass it along to their offspring. The pairings are random, but over large numbers of offspring, the percentages of resulting traits is steady. For example, the broken gene is a dominant one. If you breed a broken dam with a solid sire, you can expect one half of the kits to be broken. Why? The dam has 1 solid gene and 1 broken gene, and the sire has 2 solid genes. Since the broken is dominant and the dam will pass it along to half of her offspring, half of the kits are usually brokens. If I rebreed our broken doe multiple times in order to end up with 100 kits, I will expect roughly 50% of her 100 kits to be broken, even though the first 9 were all solid. Learn more at Rabbit Genetics. Talk about having fun with rabbit genetics...! Breeding broken tri-colored rex rabbits is not for the faint-hearted. To obtain such a nice broken tri rex rabbit, one has to properly balance body type, brindling, density of color and fur, and the spotting pattern. Current wisdom today says that you shouldn’t give a bunny anything green or fresh until they’re at least 12 weeks old. I got to thinking about that, and trying to imagine little cottontails NOT eating green things in the wild till age 12 weeks. Hard to imagine, right? There’s no such thing as a dry ration for them, and especially not in May, when the whole world is verdant. Young shoots and tempting, succulent buds are everywhere. The babies?? Healthy as horses. They were undersized relative to their cousins being fed commercial pellets, but no problem whatsoever with dreaded, and frequently fatal, bunny diarrhea. Here’s what I think -- because the energy and sugar levels were natural, even low, there was no energy excess in their guts and therefore no fermentation, germ population explosion and no diarrhea. They did fabulous! Additionally, by fresh-picking every day, the bunnies were getting live food, chock full of nutrients and enzymes just the way nature provides it. 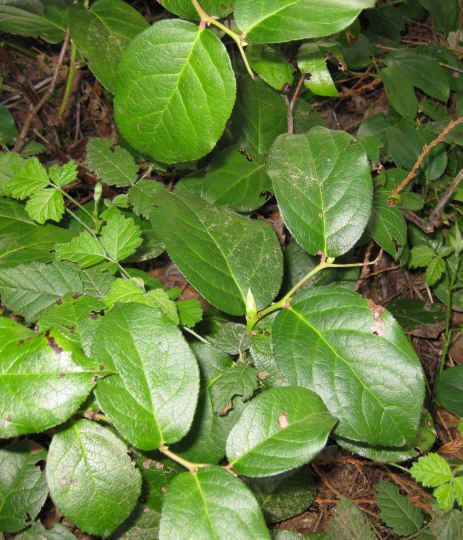 Clean, fresh, unpolluted yard scraps and weeds are great for your bunz. But, I would still go slow to start. Cut back on the pellets for a day or two to help prevent bunny diarrhea, and omit all fruit, processed or sugary treats. Once your bunz are acclimated to green feeds, you might find their health becomes vibrant, and you won’t need nearly as much commercial pellets. Saving the money is always a plus. Get more feeding tips at Feeding Rabbits. Sometime during the 1980’s, someone, or more than someone, released a few unwanted pet rabbits on the campus of the University of Victoria in British Columbia, Canada (see picture). Today the U of Victoria is overrun with over 1,000 feral rabbits. The bunnies are wreaking havoc with the grounds, digging tunnels, ripping up the landscaping, and becoming a hazard. The University has managed to catch only 50 rabbits, and has done ‘pilot programs’ aimed at spay/neuter and catching and releasing the rabbits elsewhere. They have searched for people to adopt the rabbits, without success. At this point, they are considering "more drastic measures," and should have a method of population control in place by June. What do YOU think the University of Victoria should do about the rabbits? I happen to also know that Victoria has a fairly large homeless population, due to its temperate climate (as far as Canadian climates go). I’ve walked the streets of Victoria - it’s a lovely town. So, here’s MY proposal. I think it would be great for a mission to the homeless or a homeless shelter to catch the rabbits, kill them humanely, and utilize the meat in their homeless feeding program. In fact, if the University can manage the population carefully, the feeding-the-homeless program may end up with a steady supply of free, nutritious protein for years to come. The University loses lots of the rabbits, the mission gets free lappin, and the homeless get nutritious meals. It would be a win win win all the way around--what's not to like about that? Especially since there is apparently no one willing to care for the bunnies. If the University of Victoria were to follow through on this idea, they would essentially be managing a colony of free-range rabbits. See our new Rabbit Farming page, and learn about some neighbors in downtown Minneapolis who are collaborating on managing a very small-scale urban barnyard. They've got ducks, rabbits, chickens, and a large garden. Feel free to forward this email to your friends, and have a great May!